Well hello there! It seems that I haven't written a WOMNS post on the blog in several weeks. For that matter, it appears that I haven't actually written ANY post on the blog in over a month. Oops. Apparently typing it up as a post on Facebook is just easier, and with limited time, I'm all about easy! That being said, I recently read two books that I had a hard time putting down. The first was One Summer: America, 1927 by Bill Bryson. I've read several of his other books and enjoyed most of them (his book on Australia was probably my favorite - before I read One Summer), but this one really hooked me. If you're a fan of history, random facts, and learning about people that don't necessarily make it into the history books in school (as well as some who do), and if you're not afraid of humor and sarcasm as a writing style, then I'd highly recommend adding One Summer to YOUR summer reading list. As much as I thoroughly enjoyed One Summer, it was blown out of the water (no pun intended) by Unbroken - the incredible life story of rebel, runner, Olympian, and WWII POW Louis Zamperini. I'm probably one of the last people to read this book, but just in case I'm not, let me tell you why YOU should stop reading whatever you're currently reading and find this book. I read half of it either with my mouth (literally) hanging open, or my hand over my mouth. Starting with his troubled youth where he ran from the police, stole incessantly, and was a general superstar at getting into trouble, we move into his teen years when his older brother, Pete, got him hooked on running. Zamperini excelled at it, smashing the competition in the 1500 and getting himself to the infamous 1936 Olympics in Berlin to run the 5000 (after having only competed in it twice before). Although he didn't win, his ability to dig deep and find an extra measure of strength and energy made his last lap memorable to all who saw it (including Adolf Hitler). After his Olympic debut (which, at 19, he assumed would be just a preview to his real goal of attending the 1940 Olympics in Japan), he attended college, ran a 4:08 mile, and then joined the air force in 1941 after the war broke out. He soon found himself on the crew of a B-24 that took part in the bombing of Nauru and flew back to base with hundreds of holes - so many, in fact, that the plane (called, Super Man) had to be scrapped - only to have their base bombed later that night. Louie survived, as did his friend - and pilot - Phil. A few weeks later, Louie and Phil, along with a new crew, were directed to take a derelict B-24 (The Green Hornet) up on a search and rescue mission that soon resulted in an ocean crash that would kill all but three of the crew. For the next 47 days, Louie (with broken ribs from the crash), Phil (who never flew again), and Mac (who died on day 33) drifted over 2,000 miles in a tiny rubber life raft, fighting off sharks (including a great white), delirium, and hopelessness. Without food or potable water, they lost over half their body weight while surviving on the occasional fish or hapless bird that came their way, and praying for it to rain so they would have something to drink. Just when you think it can get no worse, they arrive in the Japanese-held Marshall Islands where they are taken prisoner and thus begins 2.5 years of living hell. I seriously could not even begin to fathom what they went through - the daily beatings, the mental torture, the lack of food, adequate clothing, and medical care. It was, truly, beyond description, especially when it came to one particular guard called, simply, The Bird. Facing imminent death as a result of the Japanese "kill all" order for POW camps, Louie believed that this was it - but then the Emperor signed the surrender of Japan and suddenly Louie was free. After his return to the U.S., he was hailed as a national hero - the Olympic champion who was declared dead came back to life. He married Cynthia Applewhite in 1946 and all seemed to be going well - but the mental anguish was just beginning. With the Bird appearing in his nightmares every night, Louie began to spiral out of control, drinking heavily, driving Cynthia and his daughter away, and fixating on one day returning to Japan to kill the Bird. Hitting bottom, Cynthia finally argued him into the Billy Graham tent revival in Los Angeles in 1949. From that day on, Louie was a new man. After giving his heart to Christ, Louie never had another nightmare about the Bird. By October of 1950, he was back in Japan - not to kill those who had treated him so inhumanly, but to offer them forgiveness and share the love of God with them. Zamperini spent the rest of his life working with boys who - like him - had hit bottom and had no where else to go. Although he never participated in another Olympic games as an athlete, he carried the torch multiple times, including at the 1998 Nagano games where he ran past his final POW prison camp. To the end of his life (he passed away in 2014 at the age of 97), Zamperini desired to give his forgiveness to the Bird, but the Bird (real name Mutsuhiro Watanabe) refused to see him, holding to his deluded belief that he had done nothing wrong. The older I get, the more I find myself drawn to the jaw-dropping stories of WWII, both on the European and Pacific fronts. Louie Zamperini's inspiring will to press on through whatever life holds and his determination in the face of certain death are certainly reasons to read this book, but the story in Unbroken is made all the sweeter because of the dramatic life change brought about by being born again. His faith in Jesus turned his life #rightsideup - and that's something that resonates with me. 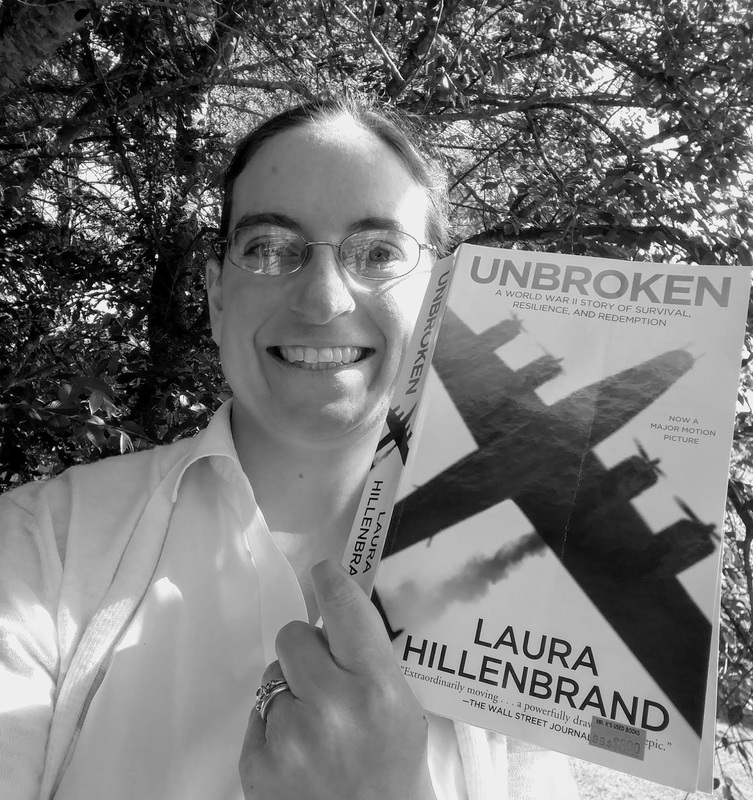 One Summer and Unbroken are definitely books that should be added to your summer reading list, but if you're only going to try one - pick the latter. What's on YOUR Summer Nightstand? I have put the Bryson book on my list (thanks). I loved Unbroken too! So much. In my mind's eye, the book I write would be researched Hillenbrand style (and I like her writing too). Large large large shoes to fill! I'm so glad you finally read Unbroken! What a phenomenal book and testimony!